“Monet Reflection” by Ginnie Cappaert. Cappaert Contemporary Gallery hosts an opening reception June 30, 4-7 pm for their Water and Wax show. This year’s exhibit is a group show featuring artists who use wax as their medium but are inspired by the water as their subject matter. Michigan artist Ingrid Blixt works her encaustic pieces into reclaimed barn wood. Mara Manning’s encaustic/cold wax paintings explore a richness in layers and textures and allows her to use tools beyond brush work. Helen Lewis, of Ohio, is drawn to water in nature, finding it beautiful, centering and peaceful. Her encaustic process of painting in thin layers of molten beeswax and damar resin are very luminous and show depth that are intrinsic to the medium. Maryland artist Bridgette Guerzon Mills combines her photography with encaustic and found materials bridging between two worlds, the real and the reconstructed. 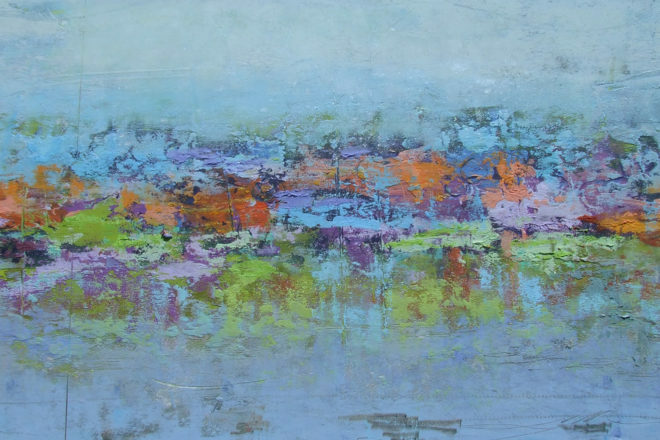 Resident artist Ginnie Cappaert showcases her new series of oil and cold wax paintings inspired by a recent trip to Monet’s Gardens in Giverny, France as well as her Door County-inspired abstracted landscapes. Water and Wax is on display until July 15 and was inspired by the Celebrate Water Door County initiative, a fund of Healthy Water Door County. 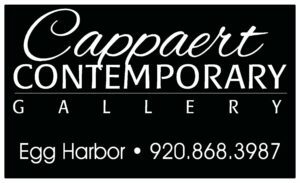 Cappaert Contemporary Gallery, located at 7901 Hwy 42 in Egg Harbor, is open 10 am – 5 pm daily through October. For more information visit cappaertcontemporary.com.